A collection of podcasts on the Law of Attraction, New Thought, Positive Thinking, Spirituality and more! Kay is finally out of her old apartment and is working the puppety connections. Matt’s gigs are going well and keeping him busy as he sets his sights on living in NYC. Brian has been busy preparing for David’s first birthday, while making some significant moves in casting for The Miracle Man. The Alicia Angel “Tour” is going well, as she enjoyed a recording session for one of the songs she wrote for Dora the Explorer and is getting ready for a retreat to Idaho next week with the great Brandie Hinen. Tip of the week: The great Dr. Joe Vitale, among many things, teaches the practice of Ho’oponopono, a Hawaiian practice of “clearing and cleaning” through reconciliation and forgiveness by uttering the mantra, “I’m sorry. Please forgive me. Thank you. I love you.” or any variation thereof. The concept behind it is that we are responsible for everything that shows up in our lives, including negative situations and negative people, and when they do show up, we need to heal the part of ourselves that attracted the negative people and situations. Check out Matt on “Flash Game” – coming soon to http://HooplaHa.com! FREE COPY OF “THE ART OF MANIFESTING” & “THE ART OF FILM FUNDING” BY CAROLE LEE DEAN! FIRST COME, FIRST SERVE! Just ask, believe & receive! Want us to help meditate on your goals & dreams? Leave a comment below, or e-mail us at manifestingmastermind@gmail.com! Thanks to http://www.purple-planet.com for supplying our theme music! Kay has been in the final stages of her move and getting ready to get things set up for more puppet fun! Matt is in the process of manifesting a move into New York City while many summer hosting gigs are popping up. Lili is currently homele… er… “on tour,” as she has discovered she was not living in her truth with her recent relationship. She’s been adjusting her Bhavanas accordingly, and seeing some great things come into fruition as a result! Brian’s in summer mode with his boys, as the school year is over and his “Fight Club” membership is currently on hold, allowing him much more time to focus on The Miracle Man, and things have finally been jump-started after a long lull! 1:00:03 – Jen, Brian, Alicia, Kay, Matt & Melissa return to Legends Diner in Secaucus, NJ, once again with Brian’s son David. In this episode, we discuss changing your thoughts from lack to abundance, how the universe/your higher self has already had your goal set for you since before you were born, being in your truth, how much of our resistance comes from the subconscious level and the importance of keeping still and being happy. Tips of the Week: Keep a Mental Bank log for everything you do that helps you further your goals, and mentally “bill” for that time, including meetings, social events, etc. and keep track of how much money you “earn” for such time. Also, keep a symbol for the universe to remind you that you’re right on track. WE ARE CREATING A CHILDREN’S TELEVISION SHOW! Using our talents for acting, music, and film/video production, and combined with passion for all things positive as well as puppetry, we have been planning a “secret” project designed to teach positive thinking, visualization, and other Law of Attraction techniques to kids! Perhaps as a pilot to pitch to a television network, or as a stand-alone DVD… we’re not quite sure yet, but we are planning this now! YOU CAN HELP MAKE THIS HAPPEN! Brian’s company Dragon Rider Productions has been entered into Chase’s Mission: Small Business program for a chance to win a $250K grant which will help fund this new project, as well as Brian’s film The Miracle Man! If you are a Facebook user, you can go to http://missionsmallbusiness.com, log in with Facebook, and in the Business Name box enter Dragon Rider Productions! Help manifest a positive future by helping us, and please pass it on! THANK YOU!!! Do you have a restaurant or establishment that you’d like us to promote? Contact us! 1:12:31 – Brian & Kay returned to Legends Diner in Secaucus, NJ… but ended up meeting Jen, Alicia, Matt & Melissa at Tick Tock Diner in Clifton, NJ. Apparently Brian wanted to manifest a salad bar, Alicia wanted to manifest an alcoholic beverage, and the universe responded in kind! In this episode, we discuss what to do when negativity shows up in your life, if things can manifest instantly and how to change negative thoughts into positive thoughts. Plug of the Week: Matt suggests you watch the film The Adustment Bureau, and think about how the universe always makes sure you’re right on time, all the time! 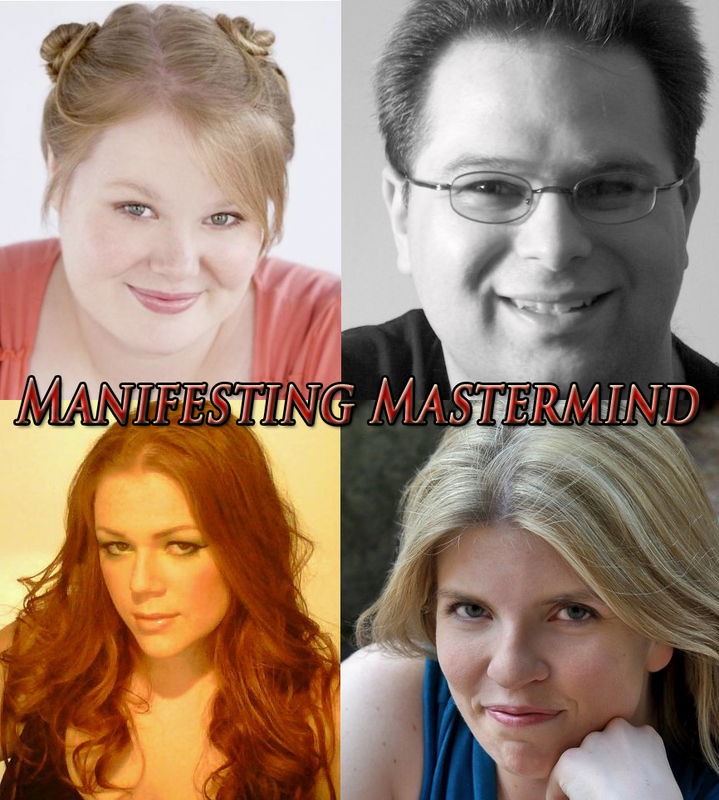 ment below, or e-mail us at manifestingmastermind@gmail.com! In our longest episode to date, this week we talk about the “miracles” we manifested, “Work Weeks” versus “Passion Weeks,” being “on time, all the time,” the Law of Attraction and kids, doing things with intention, more on the Namaste principle, letting go and allowing the universe to manifest itself to you, and thoughts and feelings and their impact on actions. 49:08 – This week Jen, Brian, Alicia & Kay return to Legends Diner in Secaucus, NJ to discuss what they’re manifesting, and how they’re doing it. Playing the role of David is our “Fight Club” friend Melissa. Jen got booked on HBO’s Boardwalk Empire. Kay’s muppet now has a name – and a tail! Alicia did her own purging last week to make room for her step-son, who is now living with her. Brian finished the filmmakers’ reel DVD and proposal for a grant to fund The Miracle Man and has been attracting the Namaste principle into his life in several ways. Tips this week: Don’t put negative thoughts such as rejection out there as your destiny. You deserve and have to be open to receive the inherent abundacne in front of you. Vibroacoustics reveals scientific proof that thoughts produce sound waves that attract other sound waves to you. Actors – check out Act Outside the Box, as well as their Facebook page. Listen to Brian & Kay next Monday, May 7, 2012, 10p-12a EDT on http://wmscradio.com! 53:11 – Welcome listeners of The Overnightscape Underground, and thanks to Frank Edward Nora for suggesting we be a part of his channel as well! This week Jen, Brian & Kay return to Legends Diner in Secaucus, NJ to discuss what they’re manifesting, and how they’re doing it. Alicia could not make it, as she has manifested her new car, as well as a resolution to the problem with the dealer! Jen was able to bring her husband and her “geese” to the red carpet premiere of Jack and Diane at the Tribecca Film Festival, and was inspired to cut her hair for the first time since her teen years. Kay has been getting rid of old stuff in preparation for her move to Hackensack. Brian completed his presentation and shooting schedule for The Miracle Man and stumbled across another fantastic potential source of funding for the film! Tips this week: Purging of the old makes way for manifesting the new! What do you do when you’re out of vibrational harmony with the universe? Do you “mute your strings,” change your situation, or allow it to be? 48:50 – A very Muppety episode! Jen, Brian, Alicia & Kay try out Legends Diner in Secaucus, NJ to discuss Muppets, what they’re manifesting, manifesting Muppets, and more and more Muppets. Jen had an opportunity to speak at her alma mater, Ramapo College, where she met the production coordinator for Sesame Street, who is now doing casting for the show! Jen may also be incorporating herself as an actress. Kay and her husband were able to see Jim Henson’s Musical World at Carnegie Hall… twice! And they were able to meet some of their Muppeteer heros! Alicia may has some upcoming recording sessions with some great artists, plus car dealership fiasco is coming to a resolution. Brian got his business taxes done, and his other company’s taxes are done much earlier, and he expects to manifest a tax rebate much sooner than anticipated, and after he completed his vision board, an opportunity for The Miracle Man appeared! Tips this week: When you start to learn how to adopt the mindset that leads to manifesting things in your life, the universe often “tests” you to see how well you are learning the lessons, much like the way Yoda tests Luke’s patience in The Empire Strikes Back. 44:57 – Jen, Brian, Alicia & Kay return to the Chit Chat Diner in Hackensack, NJ for their weekly discussion on their progress on the goals they are manifesting. Jen is meeting more like-minded people who are helping her with her career. Kay attracted herself a new home! But is it the same one Alicia was trying to manifest? Brian has been dealing with some very challenging situations and has been trying to figure out the best ways to handle them positively so as to not repel what he is trying to manifest. Alicia’s glad Mercury Retrograde is over, as it may have had an affect regarding a shady deal with a local car dealership, and money is coming her way! What are dreams trying to tell us? Tips this week: View your challenges as opportunities to grow, or understand that perhaps the universe may have something better in store for you. Have faith that all is well! FAITH = “Fully Allow It To Happen” (according to Jim Phillips). Always deal with people on their level – everyone is trying to do their best, regardless of the result. 37:13 – Jen, Brian, Alicia & Kay meet at The Tick Tock Diner in Clifton, NJ for their weekly discussion on their progress on the goals they are manifesting. Kay auditioned for Stephen Sondheim’s “Assassins” and opted to let go of fears and anxiety and, to her surprise, got cast! Alicia & her songwriting partner had a handful of great meetings and events, lining things up for when Mercury Retrograde ends. Jen’s been doing her Bavinas and other spiritual practices and is been living in happiness simply for the moment, without attachment to any outcome. Brian has been able to manifest getting work done on “The Miracle Man” while working one of his day jobs as a substitute teacher, and while he didn’t win the record-breaking lottery, he bought tickets without resistance and expects a payoff in some other way. What’s the difference between “gut feelings” and resistance? Click from the menu across the top to follow a specific show, or select a show below to see episodes here.